A. Solar panels convert sunlight to DC power. Solar cells are laminated behind tempered glass and often encased in an aluminum frame. The frames, when properly attached to a mounting system, let panels withstand expected wind and snow loads. B. Mounting clamps are generally aluminum brackets with stainless steel bolts that hold the solar panels securely against the underlying racking. Some clamps provide an electrical grounding path between the panel and underlying racking. The information to the left comes from a white paper, “The Importance Of Reliable Solar Mounting Systems,” co-authored by the above solar companies. C. Racking, which often uses a parallel metal-rail structure, provides a level framework on the roof to which solar panels are mounted. For reason of cost and durability, racking is often fabricated from extruded aluminum. D. Mounts – also referred to as L-feet, standoffs or stanchions – attach the racking to the roof surface. Mounts vary depending on roof type and material, which varies from composition shingle to corrugated metal. A 20-panel array (about 5 kW) will typically require 25 to 40 mounts. E. Flashings provide a water-resistant seal between the mounts and roof surface. The flashing redirects any water that leaks through or around the mount or fastener to a sheet of durable metal, preventing water from leaking through to the underlying roof decking. F. Direct current (DC) wiring (for string inverters) uses positive and negative wires from each panel connected to the wires on adjacent panels. A “home run” wire is connected from the last panel in the string to complete the circuit. All wires must be secured to the racking or panels so that they do not hang down or rest on the roof surface. G. Alternating current (AC) wiring (for microinverters and AC modules) uses AC cables (trunk cables or daisy chain cables) connecting each microinverter to adjacent microinverters. Cables must be secured to the racking or panels so that they do not hang down or rest on the roof surface. 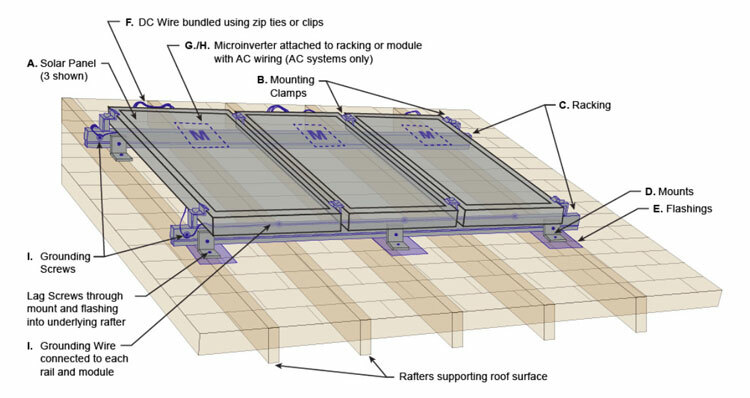 H. Microinverters (for AC systems only) on some rooftop systems mount to the back of or underneath each panel to convert from DC current directly from the panel to household AC current. I. Grounding components minimize electrical shock hazards. Every conductive metal component in an array that is likely to be energized in the event of an accidental fault must be securely grounded. Generally, small accessories such as mounts, flashings and clips do not need to be separately grounded. The above information and graphic come from the white paper, “The Importance Of Reliable Solar Mounting Systems,” co-authored by Cinnamon Solar, Solar Marketing Group, HatiCon Solar, Quick Mount PV and Orion Solar Racking. The white paper details information about how to ensure long-lasting and safe solar roof mounts. The information is based on the companies’ collective experience and the detailed study of 20 decade-old rooftop installations. Download the white paper here.